HID Omnikey 5427 - ADL Data Systems, Inc. 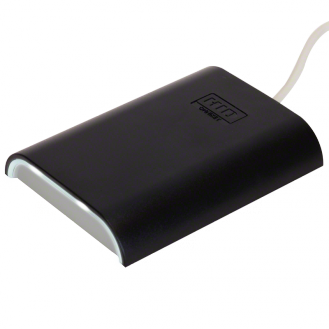 HID Global’s OMNIKEY® 5427CK Reader functions in virtually any PC environment. Independent of the operating system and use case, the reader’s CCID or Keyboard Wedge interface provide the ideal solution without the need to install or maintain drivers. This removes complex software lifecycle management issues in the field and accelerates time to market. With the keyboard wedge functionality, data from the card can be retrieved and transformed for direct input into applications using keystroke emulation. This eliminates the need for organizations to manually enter card data into applications. In addition to the standard CCID and Keyboard Wedge operation modes, the reader includes an integrated, easy-to-use web-based management tool that enables intuitive browser-based configuration without the need for special training.The OMNIKEY® 5427CK supports low and high frequency technology within a single device that enables seamless credential migration and mixed technology environments. The reader includes support for a wide range of low and high frequency card technologies, including HID Prox®, MIFARE® Classic, MIFARE DESFire® EV1, and iCLASS®, as well as iCLASS SE® and SEOS. For embedded applications, the OMNIKEY 5427CK is also available as a reader board with an included Developer Tool Kit that provides all of the necessary tools and documentation to shorten integration cycles and to accelerate time to market with finished products. Security – Enhanced system security supporting low and high frequency credentials including HID Prox®, MIFARE® Classic, MIFARE DESFire® EV1, iCLASS®, iCLASS SE, and other SIO-enabled credentials. Ease of use – Straightforward utilization of existing access control credentials for PC login in both CCID and Keyboard Wedge operation modes. CCID support – Eliminates the need to install drivers on standard operating systems. Keyboard Wedge support – Retrieves data from a card and presents the information directly to any application by emulating keyboard strokes. Fully configurable and programmable keyboard wedge functionality featuring an integrated management console. Flexible configuration of data structures and output modes. Dual frequency functionality allowing support for both low and high frequency credentials simultaneously. HID Prox®, MIFARE® Classic, MIFARE DESFire® EV1, iCLASS®, iCLASS SE®, and other SIO-enabled credentials. Easy firmware updates and configuration setting utilizing a Web interface, SNMP messages and configuration cards. Developer Tool Kit (DTK) available that contains product samples, development documentation, sample code and access to HID’s developer portal. The manufacturer’s web site may be found here.